Thank you. When I attempt to click on the link I obtain a security warning. Wasn't able to access the link. The swing graph doesn't look very good. The post impact peak bat speed is actually higher than the peak occurring at impact. Resembles a late push-like mechanic. Amateur swing. Best I can get of the swing posted. Its a members area blog that comes up and shows that whole article on mine. Not sure why. Agree. I can't tell where he slows before contact on the first plot... watching the video. He lets go of the bat with one hand and is also in socks on the stable swing video. Not sure if the plots and swings shown are correlated or how he chose to post them. All three swings plots that you posted show a second peak ... with the second peak being post impact and having the higher velocity. Here's what a similar plot would look like for a professional swing. Unlike a professional's graph, Stone's graph shows a lack of release into/through impact and a late post-impact push. This plot is his testing of Sierra Romero. He may be wishing he swung like a girl! I cant' say to much....mine may be terrible compared to hers too. Would it make more sense IYO if the bat icon is actually tracking hand speed? The sensor is actually placed on the backside of the top hand. I'm not sure if it is actually reading hand speed or bat speed but there is no bat size data entered into the program unlike the bat sensors. 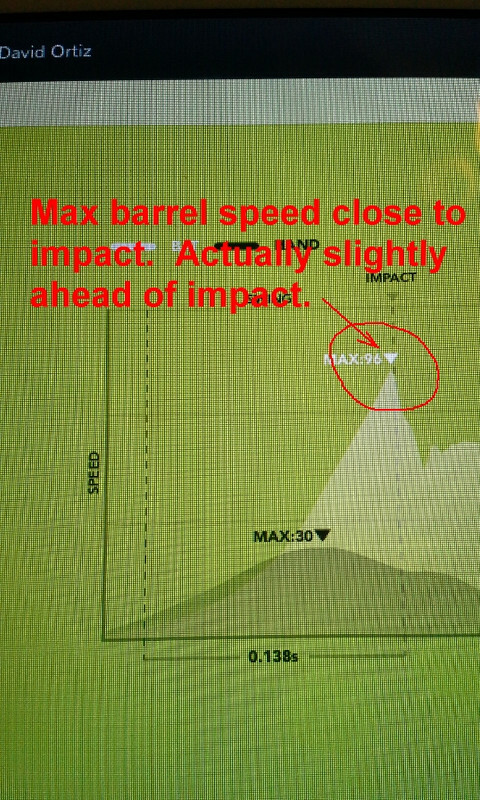 Edit: I am assuming it is hand speed that is tracked and shown on the graph with the bat icon. When my DD did her initial reading with K-motion the rep from K-motion spoke of her hand speed a lot. Which lead me to believe that the bat icon actually represents hand speed. I can probably find out for certain if anyone is interested. In the original plots shown there is a 'key' that has a symbol of a 'bat' for the top curve. That said, the graph of hand speed should not show a second peak, post-impact, that is greater than the first peak. Further, hand speed peaks out significantly prior to impact, and not at impact. More clarity on exactly what is being measured in these plots would be helpful. The reason I asked is because you said that the bat speed was slowing down into contact on some of the graphs. Wouldn't it make sense if it was actually hand speed? About the speed increasing or decreasing into and after impact, does it make a difference that the K-motion vest is measuring in degrees/sec? If I am thinking of degrees/sec correctly, wouldn't the release of the bat head (which IMO is a wrist action) and roll over increase that measurement? In the video he has the sensor strapped on top of his front wrist...not on the back of the hand as other pics have shown when its used. I could see how this is not representative of his hands or barrel. I misspoke earlier, the sensor was placed under her batting glove of the bottom hand not top.